Trains stalling on Electrofrog points? Here’s the one solution I’ve found. I hope it works for you too. For my latest layout I’m using trialling Tortoise and Cobolt point motors with live, Electrofrog, points. I’ve not used these motors before and have been very impressed so far. But one challenge I did come up against was that the locos regularly stalled when running over them. They worked fine previously so I was puzzled as to why it should suddenly become a problem. And it’s not just me. In lots of comments, modellers have dozens of electrofrogs working without modification so what’s going on? The answer I’ve found is due to a modification I made to the points for use with the Tortoise Point Machines. Electrofrog, and Isofrog points for that matter, have springs in them that assists with the movement of the switch blade (also known as closure rails) and also push the switch blade firmly against the stock rail to provide a good surface mate allowing electricity to pass between them. When using slow motion point motors, such as the Tortoise and Colbolt varieties, the recommendation is to remove the spring*. 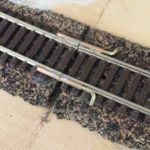 As members of American Model Railroader’s forum elaborate leaving the spring in place means you lose the glorious slow motion action as the rails they just snap over as normal. No lovely slow point movement hence the desire to remove this spring. But the downside of not having the spring of course is that the blades aren’t always pushed as tightly against the rails and then fail to make full contact with resulting in loss of electricity being passed. And with no power to the switch blades locomotives — especially short wheel base locos — can cut out as they cross them. It can also cause derailments. Anatony of a live, electrofrog, point. What’s needed is to ensure the switch blades are powered, even if the contact between them and the stock rails isn’t great. The most common solution is to add a bonding wire. As Graham Muz explains, this is done by adding a link wire between switch blade to its adjacent stock rail with a short wire link as this ensures good electrical continuity. Alternatively, you can use dropper wires, feeding power directly. Oh, as an extra. On some points you might need to cut the rails before the frog. But trust me when I say getting in between the outer rails to cut the inner rails is not easy. I use my Dremel with a cutting disc which makes it a lot easier. Another potential problem is revealed in this discussion. Dirt can build up between the switch blades and stock rails and they the surface where they meet needs occasional cleaning. (The technique to do this being paper soaked in cleaning fluid dragged between the blade and rail). Testing and trials so far have shown that powering the switch blades, either through bonding wires to the corresponding rails or feeding electricity directly to them with their own droppers solves this problem and improves run-in quality. It’s a scary operation to carry out – the risk is wrecked points – but I’ll be doing it to all my points in future and expect it to dramatically improve my operating experience. It’s just a shame point manufacturer’s don’t do this for all points by default. Of course, modifying points like this can easily result in properly damaging them and so should only be done if you’re prepared to take the risk but if you are and carry out it’ll hopefully improve the running of your layout.